in the Port of Coega Eastern Cape South Africa. with the Gemini 720i multi beam sonar, 1Cam Alpha HD camera, Hydrolek 5-function manipulator and the Tritech Micronav USBL system. confirmation and orientation and confirm container numbers and record GPS locations for recovery team. Mosselbay Harbour is situated halfway between Cape Town and Port Elizabeth and is the smallest of the commercial harbours along the South African coast. Today Mosselbay is an active harbour catering for the local fishing industry. An increasing number of ships for the emerging oil industry call at Mosselbay. In keeping with this industry a full diving service is available for underwater inspection, hull cleaning, salvage etc. Next up, SAROV helped Transnet with the general maintenance of Port Elizabeth’s harbour. For this harbour quay inspection and debris survey; SAROV acquired a multi beam sonar which allows for full operation in zero visibility conditions. 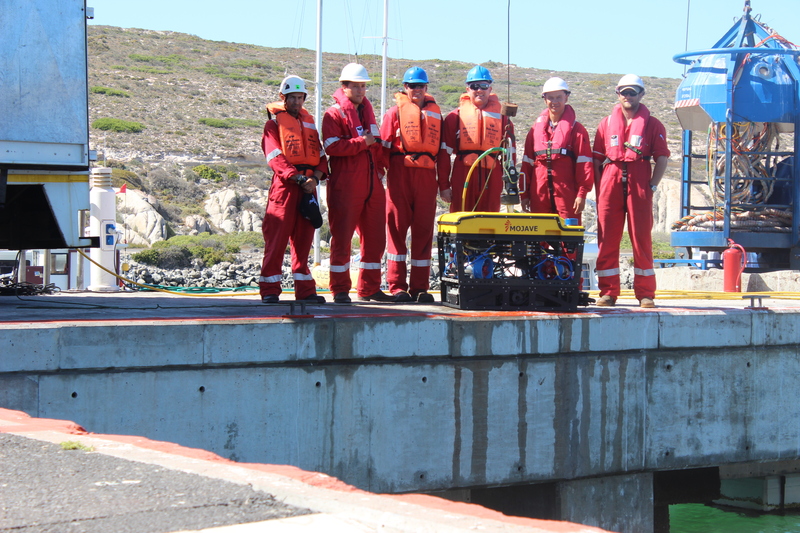 The pilots who did their training earlier that year gained valuable insight and technical experience as they assisted in the installation of the multi beam sonar. Here the team split up from the supervisors and worked on separate vessels side by side. One of SAROV’s in-house trained pilots was operating from the NDK (Nigeria Delta King). The company assisted Hydro dive in a GVI (General Visual Inspection) and a CVI (close-up Visual Inspection) for the lifting and shifting of the umbilical and flow-line(6 inch). SAROV collaborated with Subtech and was awarded the contract to inspect the 7,7 km sewerage pipeline leading out of Durban City. SAROV launches SA’s first training programme to offer 100 hours of flying time. The 12 week programme was set in the idyllic town of Gordon’s Bay. Exercises and training modules were carried out in the picturesque setting of blue rock quarry. SAROV explores new territory, as the company performed a mine shaft inspection, from 850m below the ground.